There’s a big difference between a functional hotel and a home away from home. Somewhere you want just as a bed for the night, and somewhere you want to be able to relax and indulge. And Hotel Xenia offers the best of both – its central location in the heart of Kensington makes it perfect for exploring, while its decadent interior, five star service and boutique style make for the ideal base to relax and rejuvenate. As you enter the door to the hotel, you are greeted with a decadent lobby in beautiful jewel colours with plush velvet furniture and sparkling chandelier lights. Fresh flowers spill from large vases, filling the space with delicious floral scents and reception staff are waiting to help check you in. Check in is smooth and it’s just a short elevator ride to your room. Hotel Xenia gets its name from the ancient Greek concept of hospitality and the concept of kindness and welcoming to strangers and visitors. The hotel comprises of 99 individual rooms, two contemporary bars, a private dining room, meeting rooms and their own fine dining Italian restaurant – Evoluzione. The room is cosily charming, with striped wallpaper in a soft green, and black and white photos of London hanging in frames. A thick white duvet covers the bed, with a sumptuously soft light green throw and rustic designed cushions. A sofa sits at the end of the bed, begging for time spent sipping a glass of wine in your dressing gown after a hot bubble bath, or a mug of hot coffee from the Nespresso machine in the morning. Elegant curtains drape over large windows which let plenty of light flood in during the day, and shut out the street lights once the sun goes down. In an executive room you can also make use of an in-room tablet with a directory and internet access. The bathroom is also beautifully decorated and styled, with sleek white tiles, a bath with an attached shower, large mirror and complimentary toiletries. Before or after dinner, head to the Living Wall for a cocktail in the Hotel Xenia vibrant bar concept. There is a host of premium European beers, as well as extensive wine, spirit and cocktail menus. You can either sit inside or outside depending on the weather, with a beautifully relaxing interior, and heated herb garden outside – an ideal place to spend balmy summer evenings. When you’ve finished your pre-dinner cocktail, make your way to Evoluzione – a contemporary Italian kitchen headed up by Michelin Star awarded Italian Chef Andrea Angeletti, who works to bring his distinctive flair to each and every dish. Andrea prides himself in marrying Italian culinary traditions with personal interpretation, astonishing creativity and unexpected flavour combinations, using only the top ingredients. The restaurant is a bright and contemporary space with a luxurious flair. Sit in soft armchairs made from swish velvet or smooth leather, while you peruse the menu, sipping on a glass of their recommended wine. Starters include the likes of ricotta mousse with salted biscuit, walnuts and saba sauce, roasted carpaccio beef, with mashed Vitelotte potatoes, Parmesan ice cream and crispy pan brioche, or prawns and squid steamed with black truffle potatoes and mushroom foam. Each and every dish is cooked with precision and teeming with flavour and portions are of a good size. Mains you can choose from the likes of braised beef cheek with spring onions, carrots and celeriac sauce, grilled beef fillets with melted Gorgonzola, truffle potatoes and roasted spinach and baked red mullet with caramelised fennel and Porto reduction sauce. Again, each dish is teeming with flavour and offers unique twists on classic dishes. Be sure to keep room for dessert as it’s one course you’ll regret if you don’t. 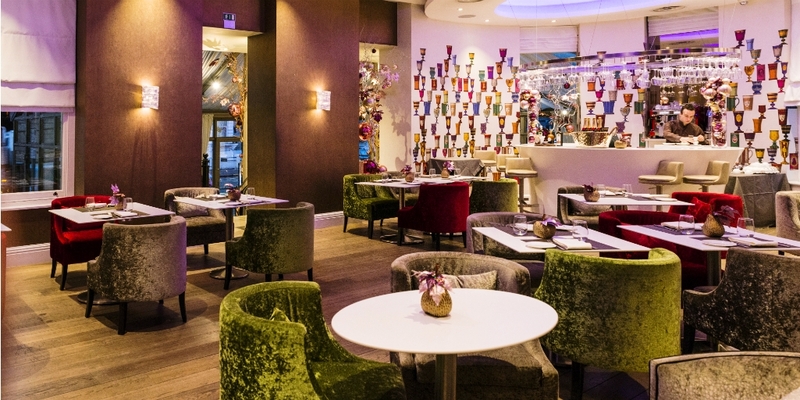 Other foodie delights at Hotel Xenia include their Italian grazing lunch at £30 per person. This includes three dishes per person and one glass of wine, sat al fresco when the sun shines, or in Evoluzione when it’s not so good weather. You can also enjoy a delicious platter and pairing wines with a selection of Italian cheeses, cured meats and two accompanying glasses of wine per person – priced at £29 per person. A third dining option is their Prosecco brunch where you can begin your day with speciality Italian coffee and a continental selection such as freshly baked pastries, fruits and yoghurts, followed by your choice of Eggs Royale, Florentine or Benedict and free flowing Prosecco or bloody Mary’s for 90 minutes. This is priced at £45 per person and is available 10am-2pm on Saturdays and Sundays only. The area where Hotel Xenia is situated offers plenty for you to do. In the heart of the Royal Borough of Kensington and Chelsea, it is walking distance from the Victoria and Albert Museum, the Natural History Museum, the Science Museum, Kensington Gardens and Hyde Park. 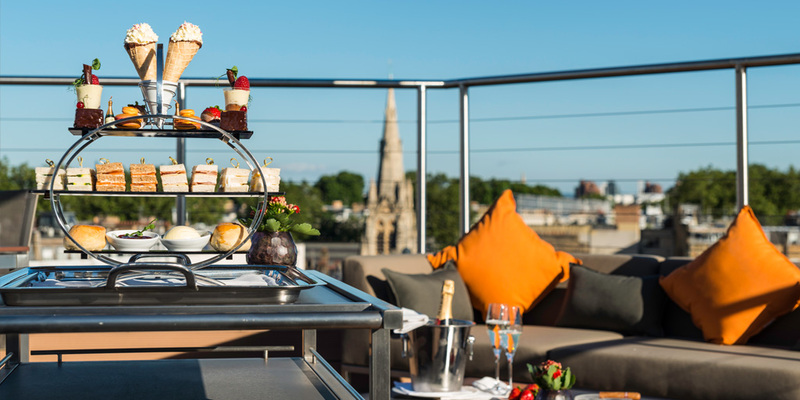 Hotel Xenia offers all you could want from a city break and more, offering a convenient location in the heart of London, with all the luxuries and comforts you could wish for. Head here with your other half for a romantic break, or take your Mum for a girls weekend and enjoy the prosecco brunch. Whatever your reason for a break away, make Hotel Xenia your choice to stay.